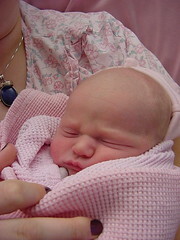 The day Eden was born was posted on February 13th, 2006 at 9.23am and is filed under Eden.. I woke up on the 11th at about 8am to what I can only describe as a rush of water. I remember reaching down to check if anything was wet, and when I realized nothing was, I figured that it was just a dream. When I stood up the water all rushed out. I was soaked. Jim had been laid off from his job two weeks before, so he was in the basement working on his computer. I yelled down at him and he came up to see that my water broke. We were both so excited, we knew that this was the real deal. I took my time getting ready and packing for the hospital. I wasn’t contracting, but barely having cramps. When we got there, the midwife checked me and told me my options. The baby needed to be out within 18 hours of my water breaking or there would be a risk of infection and I’d have to be on antibiotics. She wanted to go ahead and induce labor at that point, but I was determined to not be induced. We decided that we’d go home and try to get labor going and meet her back at the hospital at 5pm if nothing was happening by then. We walked and walked and walked. Nothing happened. We sat and watched a stupid movie. I was just not going into labor. So I finally decided that I didn’t want to wait until 5pm and we headed back to the hospital around 2 or 3. My midwife put some gel on my cervix. It sucked, I had to stay laying down on the bed for an hour. Labor started, but it wasn’t anything productive. The contractions were coming, but they weren’t progressing. I think it was finally around 8 or 9pm when I gave in and decided that I would go to the next step of induction. She put a 1/4 of a pill called cytotec on my cervix. Then was when the contractions started really coming. I got in the hot tub for awhile. The contractions started to get really bad. After having Honor and knowing how fast I labored, I think that at this point things would have gone really fast. But not knowing that, and thinking that I had hours to go, I requested some IV medication. It knocked me out, but didn’t do anything for the pain. It probably slowed things down, but I think it was enough that I could finally sleep between contractions. She was born with the grumpy face. It still seems like it just happened, and it was four years ago. She’s gotten so big. The births…you never forget one detail. Isn’t that great? I love it. chills again. Happy birthday, Eden..and Happy Mom Day Allison!!! OOOOOH sweet! I love birth stories! 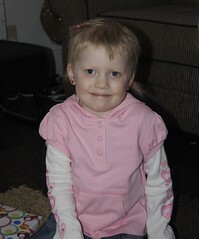 She was and still is a gorgeous kid. I hope you guys had a great celebration! I like her grumpy face………Happy birthday, Eden! Awwwww. Happy Birth/Birthing day to you both. I can’t believe you have a four year old! Congrats to Eden for hanging out on this swiftly tilting planet. We love having her here and can’t wait to see what the next four years brings us! PS Baby Anya says she misses you. 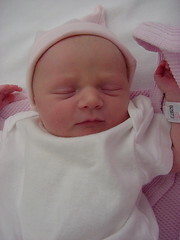 She was a lovely newborn, and is a lovely four year old as well. Happy b-day to her! Happy Birthday, Eden! What a story. I love the birth stories (mainly because by then the birth is mercifully OVER).